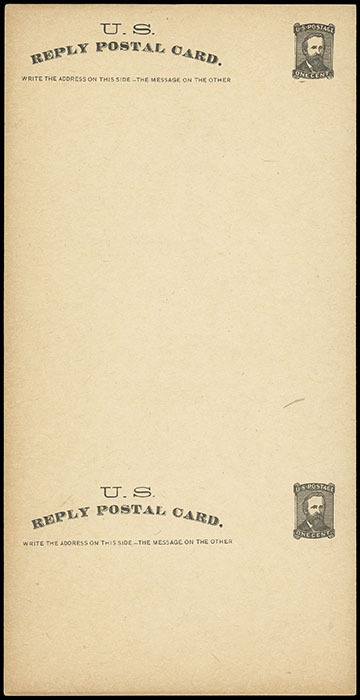 Franklin W. Brooks, New York, 1¢ + 1¢ Black on Buff, Paid Reply Card Essay, Three unfolded large format cards with printing at top and bottom, one 132 x 258mm with "Tear off communication, and write reply on back of enclosed card." printed at bottom, one 132 x 258mm without the bottom printing, and one 131 x 240mm possibly trimmed to remove the printing at bottom, Very Fine and rare group. USPCC No. MR1E-Jd, Kb $1,600. 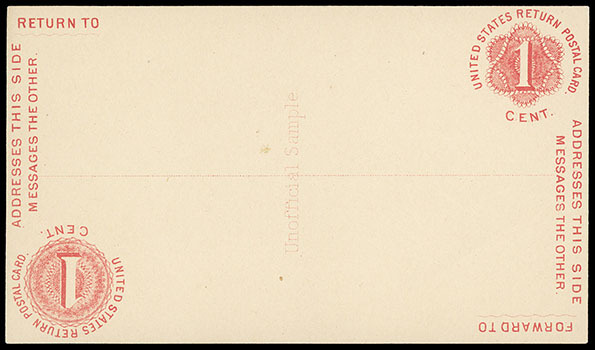 Charles K. Marshall, Vicksburg Miss., Paid Reply Postal Card Essay, 1¢ + 1¢ Red Orange, from the Second Marshall essays, on 131 x 76 mm dull v. faint o-yellow card, Very Fine. This second Marshall essay having stamp representations in diagonally opposite corners. 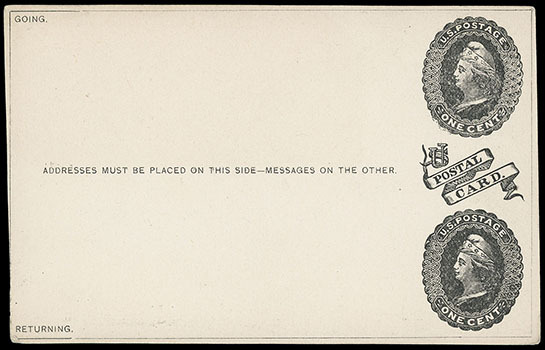 Robert W. Mercer Paid Reply Card Essay, 1¢ + 1¢ on wove, first style with two woodcut "stamps" at right, titled "U.S. Postage One Cent" with "Postal Card" between and "Address must be placed on this side - message on the other" printed at center, frameline around perimeter, mailed bearing two 2¢ red brown (210) singles, top tied by "Cincinnati O., Jul 14 '86" duplex addressed to Chicago Ill., returned with second 2¢ tied by "Chicago, Ill., Jul 19 '85" duplex to R.W. 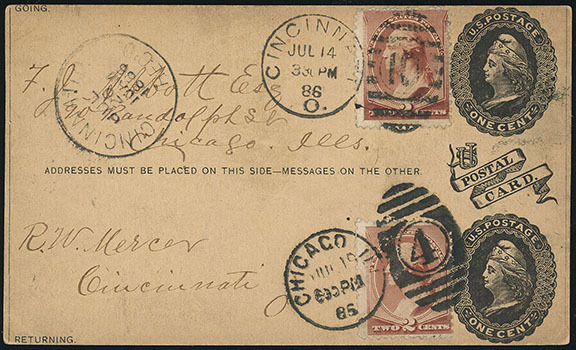 Mercer at Cincinnati, Jul 26th receiver, message from R.W. Mercer reads "How much will you pay for the loan of this card with an article in regard to the merits of this duplex post card. 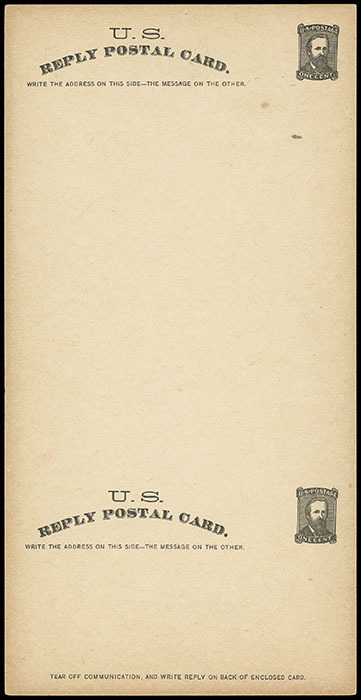 Reply on this card" and the response from Editor of The Stamp Collector: "We hardly see how we can use this and therefore cannot make an offer"; slight aging, F.-V.F., a rare through-the-mails use of a postal card essay. USPCC No. UY1E-TA Estimate $750 - 1,000. The postage on this card essay was of course not recognized as this was not issued by the Post Office, and therefore not a postal card. Mercer aggressively pursued acceptance of his cards with many letters to the Post Office Department. Apparently, the only reaction of the Department was to take exception to Mercer's use of "U.S. Postage in his design. This essay was discussed in a Postal Stationery (Jul.-Aug. 1962) article. Robert W. Mercer Paid Reply Card Essay, 1¢ + 1¢ on wove, Style with two woodcut stamps at right, titled "U.S. Postage One Cent" with "Postal Card" between and "Address must be placed on this side - message on the other" printed at center, frameline around perimeter, two examples, one on buff card and other on 17 g/4 smoky v. faint o-yellow thin wove card; former with creasing, F.-V.F.